This fantastic, attractive yellow / golden skinned gage is large and round. 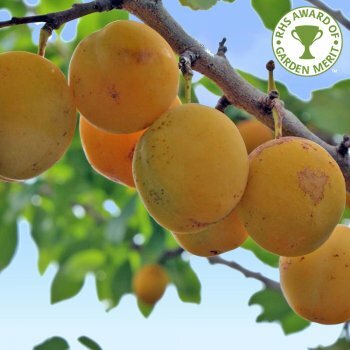 The gages have moderately sweet translucent, yellow flesh and are ideal for bottling and freezing as well as for eating fresh. Oullins Golden Gage is self fertile and so doesn't require a pollination partner making it ideal when there is room for just one tree. Plum, Gage & Damson trees will not grow happily in a pot long term, they need to be planted in the ground. All other fruit trees can be container grown. Plum/gage trees should be planted at a minimum of approx. 3m between each tree. Our pot grown Oullins Golden Gage trees can be planted at any time of the year, whereas bare root Oullins Golden Gage trees need to be planted between November and March. Pixy (dwarf):3 metres (9 feet) in 10 years - ideal for smaller gardens as specimen trees and suited to fan training.